Yay, new year and new stuff to see! And while the calendar isn’t quite as full as I’d like it, I’m looking forward to everything just THAT MUCH MORE to compensate. Ready? UNDERBELLY at the Gladstone Theatre, from Stars and Hearts. 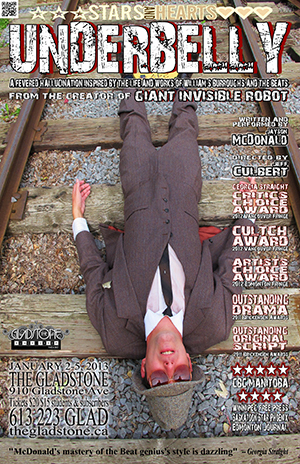 The final part of the second BLACK BOX SERIES put on by Black Sheep Theatre, and they’ve brought us a sweet treat…Jayson (GIANT INVISIBLE ROBOT) McDonald’s one man show about William Burroughs, that tore up the Fringe circuit last year! Plays the 2nd thru 5th, and you’d be crazy to miss it. MRS.DALLY HAS A LOVER at 94B Montreal Road (behind Lorenzo’s Pizza, Palace st. Entrance), from A.C.T.Ottawa. A bit of a risque sounding show from the gang at ACT Ottawa, featuring Genevieve Sirois from my fav’rit show of ’12, HOW IT WORKS. Good enough for me. From the 3rd to 12th. A COMPANY OF FOOLS TWELFTH NIGHT CELEBRATION at the NAC 4th Stage. It’s that time of year again, for the Fools to fundraise, party, and announce their plans for the year! Always a great time…this Saturday, the 5th. ALL MY SONS at the Ottawa Little Theatre. Arthur Miller’s family/war drama from 1947, as the OLT’s 100th anniversary season marches on! From the 8th to the 26th. BLUE BOX at the Great Canadian Theatre Company, from Nightswimming Theatre. Carmen Aguirre’s runaway UNDERCURRENTS hit is back on the big stge, and you know what that means…more room to dance! Previews start on the 15th, show runs until February 3rd! 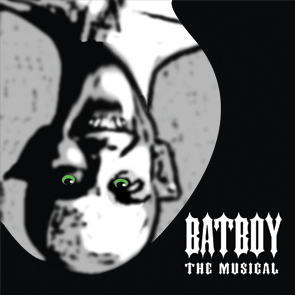 BAT BOY THE MUSICAL at the Gladstone Theatre, from Black Sheep Theatre. A musical so weird and cool sounding, it tempted Kris Joseph back from the wilds of Alberta (or whichever flat province he’s relocated to)! Ya know you want to see this. 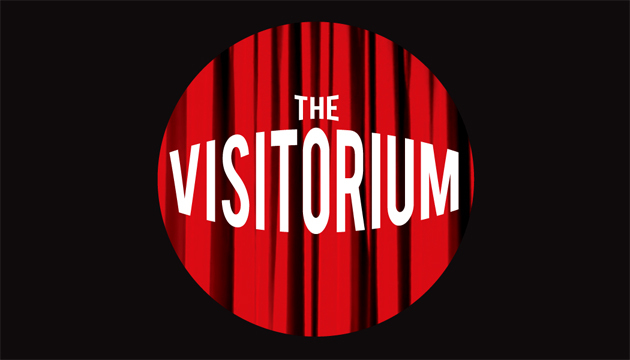 Previews start on the 16th, show runs until February 2nd. ROUGE DECANTE at the National Arts Centre. A harrowing-sounding bit of multimedia storytelling from the NAC French Theatre gang. From the 16th to 19th. REASONS TO BE PRETTY at the Saw Gallery, from Red.Collective. The Reddies keep their momentum going into 2013 with a very anticipated bit of Neil Labute, from director Fraser Mackinnon. Sweet! From the 17th to 20th. WHEN AFRICA CALLS UHURU at St.James United Church in the glebe, from Third Wall Theatre. The lastest in their EMPTY SPACE series, this reading of Henry Beissels’ work features Beissel himself alongside Kaite Bunting, and 3rd Wal gugu James Richardson. The 23rd, one night only! THE ROCKY HORROR SHOW at the Kailash Mital Theatre, from Sock ‘n’ Buskin. Apparently still stoked from the success of COMPANY last year, the SnB gang are back on the musical path once again, with the cultiest of cult things ever. 17th to 19th, and 24th to 26th! EDREDON at the National Arts Centre. A French children’s show, with some cool looking use of light and shadow…might be one for anyone to check out, methinks. From the 23rd thru 27th. METAMORPHOSES at the National Arts Centre. Just squeaking in with previews starting on the 29th, the NAC English Theatre season continues with this adaptation of Ovid and his wacky tales. And the good folks at CRUSH IMPROV will keep on keeping on despite the loss of their Elmdale homestead. The first ‘BOUT TIME of the year will be at Cafe Ceckuf in the Market on Monday the 7th, and among all the usual reasons to go, this may be your last chance to see the great Ken Godmere on stage before he skedaddles to Vancouver! And Crush will be back later in the month with the latest in their SPOTLIGHT ON… shows at the Gladstone theatre, on the 26th. And hey, if you’re in Toronto, the NEXT STAGE FESTIVAL is kicking into gear right about now, for a run from the 2nd to 13th at the Factory Theatre. Laura Haris’ excellent PITCH BLOND will be there…what else do you need to know? 10 sows over 12 days, with a heated beer tent outside. Wish I was there! Previous 2012 – Big Stoopid End of Year Post!